The Faculty of Nursing and Health Sciences along with the Alumni Office held a reunion for all the faculty’s alumni on Tuesday, 2 April 2019. The open day aimed to empower nurses in the field of health work and to strengthen the management and leadership skills of senior students. 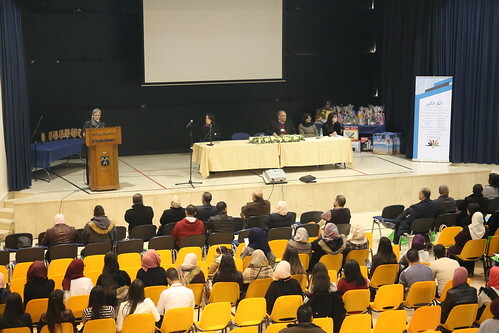 Vice President for Academic Affairs, Dr. Irene Hazou; the Dean of the Faculty of Nursing, Mariam Awad; Bethlehem Governor, Kamel Humeid; Head of the Palestinian Nursing and Midwifery Association, Sulaiman Turkuman; Faculty members and senior students of the Nursing Faculty, in addition to around 200 alumni attended the event. Dr. Hazou welcomed the graduates on campus and said that the University is proud of its graduates who have a vital role in serving the community. Dean Mariam Awad said this was an opportunity for the graduates to come back on campus and see the development of the university in general and especially the faculty. She added that Bethlehem University was the first university that started teaching a Bachelor of Nursing which helped in transforming nursing from a service to a profession based on knowledge. Bethlehem Governor, Kamel Humeid, said in a speech that he was proud to be a Bethlehem University graduate. He stressed the need to continue the University’s mission and praised the support the University gives to its graduates. Head of the Palestinian Nursing and Midwifery Association, Mr. Sulaiman Turkuman, talked about the Palestinian achievements in the International Council of Nurses despite the political and economic situations. He also indicated that there is an international cooperation to start a Ph.D. program in nursing which will be soon discussed with all the Palestinian universities. The Lecturer in the Faculty of Nursing, Naji Abu Ali, said that this day was organized by senior students to develop their leadership and administrative skills. He stressed the need to invest in nurses and enhance their impact to improve the quality of health care. The Alumni Relations Officer, Haneen Musleh, emphasized the importance of reconnecting and preserving ties with graduates. She also invited the senior students to attend the career day that will be held next week on campus. On behalf of senior students, Ghaida` Dawoud thanked the alumni for attending the event and emphasized the importance of teamwork. The open day included a panel discussion, showing a video on the history of the faculty, a dabka dance, and a musical performance.